I am slightly obsessed with sugar skulls and last year I bought this sugar skull cookie stamp from Typo. And then I forgot all about it! When I was planning my Halloween baking I finally remembered to use it! I was looking for something savoury to take a break from all the sweet treats I was baking. So I just needed to find a savoury biscuit recipe that wasn’t too crumbly. Then I remembered my group leader had made the Macadamia and Parmesan biscuits from the Everyday Cooking for Thermomix Families TM5 cookbook when it was first released. These biscuits are simply delicious! 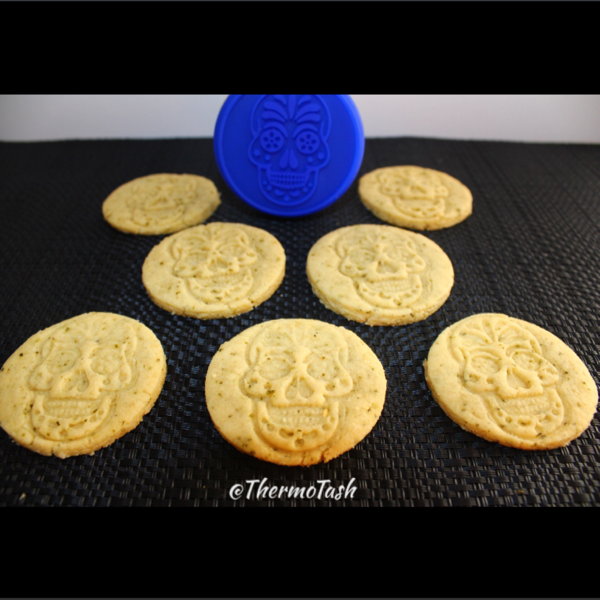 And I knew they would be the right texture for my cookie stamp. Made with parmesan, rosemary, macadamia nuts, butter and plain flour. In less than a minute the dough is made and ready to roll. I rolled it out and used my largest round cookie cutter to cut the dough and then placed each biscuit onto my prepared tray. Then I pressed my sugar skull stamp into each biscuit (I used a bit of flour on the stamp when it started getting too sticky) and baked them for about 10 minutes. 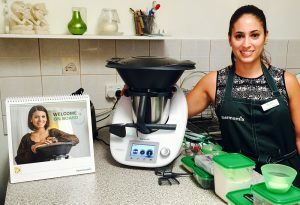 Don’t have the Everyday Cooking for Thermomix Families TM5 cookbook? Contact your consultant or purchase your own copy here.